The Z11 Neo is a much needed refresh to the Z11 lineup from Zalman. The Z11 was getting long in the tooth since it was originally launched in March 2012 and didn’t have an internal USB 3.0 header, which was a major issue for many consumers. While keeping the aggressive styling and improving upon the functionality of the original Z11, Zalman hoped the Z11 Neo refresh would be a hit with consumers. While it hits most of the necessary points a case needs to in order to make itself competitive in a very crowded market, it still finds itself in a tough position against cases like the Corsair 300R ($69.99 shipped) and NZXT S340 ($69.99 shipped), both of which offer more refined cable management options for close to the same price (depends on rebates and promotional discounts at any given time). With that said, the Z11 Neo from Zalman is a fine case from a well-known brand and has a unique style that I find to be very visually appealing. Beyond the visual appeal, the Z11 Neo has a solid build quality, with strong side panels that don’t flex or bend. The window is nicely implemented, but is severely scratch prone. 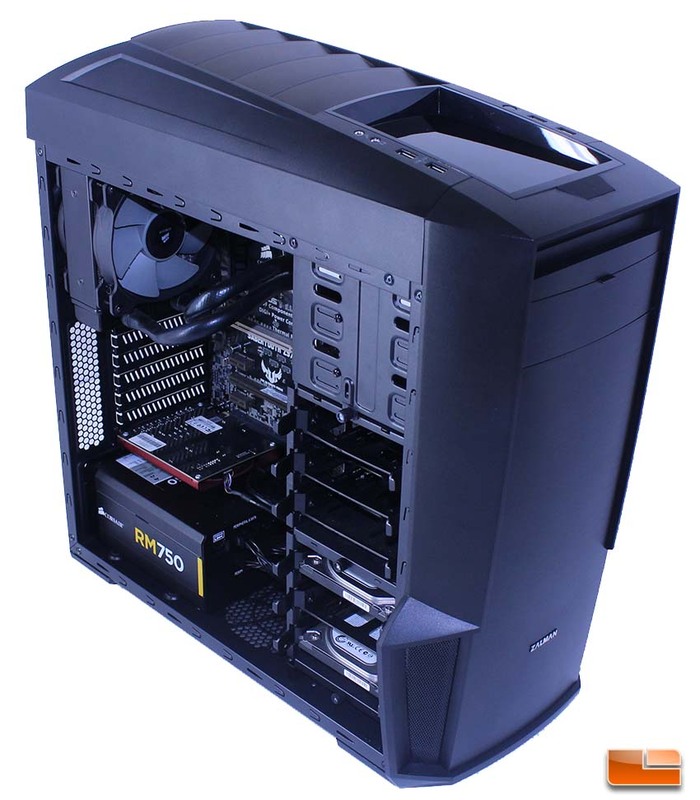 Ours arrived with a scratch from the factory, so Zalman could definitely improve in this area. The cooling options on the Z11 Neo are interesting, but I’d really like to see them get rid of the 80MM fan intakes and have a standard sized intake on the side panel to aid in GPU cooling, as the 80MM fans are just loud and ineffective. Not including rubber grommets on the cable management holes and including fans powered by Molex connectors were two annoyances that I think hurt this case and it seems like Zalman could have easily remedied this. Including Molex-powered fans that can’t easily be speed controlled on a modern chassis is just not acceptable. Taking an already proven design and improving on it generally is a proven concept and while Zalman hasn’t done enough with the Z11 Neo to really make it stand out against the pack, it has done enough to make it an option. Aggressive styling and solid build quality are on the side of the Z11 Neo and it offers just enough to keep itself in the running with other cases in it’s price range. At $54.99 shipped (after rebate), Zalman has made the Z11 Neo accessible for consumers who are looking for a unique looking case that will be able to host a modest to mid-range enthusiast system. There is very stiff competition in this price range and I don’t think the Z11 Neo sets itself apart from the competition in many areas, but it also doesn’t fall behind, either. I noted some small issues with aesthetic functionality that I think Zalman can address to make it a better value, but as it stands, the Z11 Neo earns our recommendation for having solid build quality, unique styling and decent functionality. Had Zalman taken a little more time and really refined the Z11 Neo and thought some of the features out a little more, I think they would have a true winner on their hands rather than just a case we can recommend as an option. Legit Bottom Line: The Zalman Z11 Neo is a nice update to the original Z11 that came out in 2012 and the introductory price of $55 shipped keeps price competitive for the time being.